Mrs. J.M. Harrison lived at 1993 Beach Avenue in 1916. She was also at 1326 10th Avenue in 1915, and at 1492 Harwood Street from 1917 to 1919. Although it is not certain, it appears that she was the widow of Rev. James Morrell (or Murrell) Harrison. If so, she was born Annie Philip in Inveresque, Scotland on July 10, 1846. Her father was John Weston Philip (sometimes spelled Philip or Phillips) (1808-1897). Annie’s mother was Helen (or Ellen) Knox (1807-1885). Annie and her parents travelled to Canada in the 1850s. In 1877, they arrived in the Roland district, southwest of Winnipeg, Manitoba. Soon after that, Annie met and married Rev. James Morrell Harrison, who was a Methodist clergyman. He was born in Ontario on October 13, 1849. His father was Edmund Brailsford Harrison (1820-1907). Edmund Brailsford Harrison on a ship called the Brailsford, off Africa’s Cape of Good Hope. “Ontario Deaths, 1869-1937 and Overseas Deaths, 1939-1947,” database with images, FamilySearch (https://familysearch.org/ark:/61903/1:1:JF56-XS4 : 11 December 2014), William Thomas Harrison, 25 Jul 1925; citing Otonabee, Peterboro, Ontario, Canada, 598, Archives of Ontario, Toronto; FHL microfilm 2,057,335. The Brailsford was an East Indiaman sailing ship, built in Gainsborough, England, in 1811. In 1820 the Brailsford sailed from London to Bombay, India. John Spring was the captain of the ship. The Register of Shipping for 1821, Society of Merchants, Shipowners and Underwriters; London, printed by C. F. Seyfang, 1820; reprinted by Gregg Press, London, unknown date; unpaged; https://books.google.ca/books?id=EVfNX__5ZZsC&pg=RA19-PA1820&lpg=RA19-PA1820&dq=brailsford#v=onepage&q=brailsford&f=false. James Harrison’s mother was Mary Sailsbury (1826-1888). 1891 Moose Jaw, Northwest Territories (later Saskatchewan). 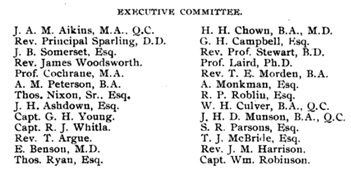 James was on the executive of Wesley College at the University of Manitoba. He was the first president of the Manitoba Methodist Conference. After Alberta and Saskatchewan became provinces in 1905, he became the first president of the Alberta Conference. James and Annie continued to serve the church until 1915. James had become ill, and the family decided to move to Summerland, British Columbia, where they had a fruit farm. 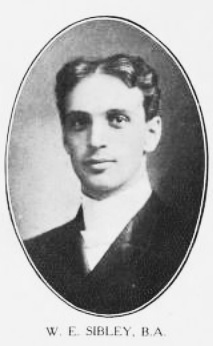 James died in Summerland on August 16, 1915. He was buried in Peach Orchard Cemetery in Summerland. It appears that Annie lived in Vancouver from 1915 to 1918. In 1921, she was living near Edmonton, Alberta with her daughter, Beatrice, and Beatrice’s husband, Thomas Reed. In 1922, Annie went to Westlock, Alberta, to live with Beatrice and her husband. Annie died in Nanaimo, British Columbia, on August 31, 1942. She was buried in the Nanaimo Municipal Cemetery. James and Annie had the following children. Mary Edith Harrison (often called “Edith”) was born in Manitoba in 1879. She went to school in Roland, Manitoba. She was very musical, and she was a good student. In 1906 she married Rev. William Edward Sibley. He was born in 1876 in Erin, Ontario. W. E. Sibley, The “Victoria Eight,” Victoria University, Toronto, http://library.vicu.utoronto.ca/exhibitions/vic_in_china/sections/missionaries_and_mission_stations/attachments/actavictoriana3002vic8wallace_poem.pdf. Later William and Edith went to work as missionaries in West China. Edith was killed in Chengdu (Chengtu), China, in 1926. 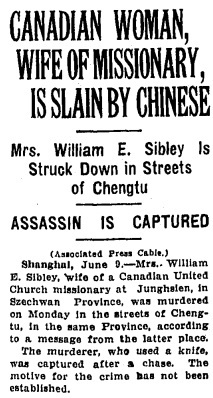 “Canadian Woman, Wife of Missionary, Is Slain By Chinese; Mrs. William E. Sibley is Struck Down in Streets of Chengtu; Assassin is Captured,” Toronto Globe, June 10, 1926, page 1. 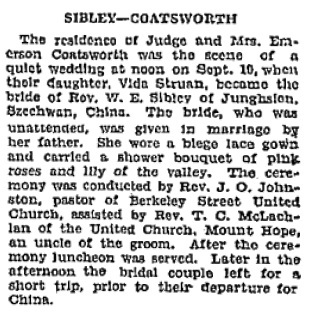 In 1928, William married Vida Struan Coatsworth. She was the daughter of Emerson Coatsworth, a member of the Canadian Parliament, judge and the former mayor of Toronto. Vida Struan Coatsworth and W.E. Sibley, marriage announcement, Toronto Globe, September 20, 1928, page 16. William and Vida stayed in China until they returned to Ontario in 1937. William retired in 1941 and moved to Toronto. He died in Toronto in 1959. “Served in China For 30 Years,” Rev. W. E. Sibley, Toronto Globe and Mail, July 17, 1959, page 5. Vida died between 1959 and 1995. William and Mary had a daughter, Mary Sibley. She was living in Kingston, Ontario, in 1959. She died in Kingston on June 17, 1987. Ellie Knox Harrison was born in Manitoba in 1881. Apparently she died in Medicine Hat, Alberta, in 1906. Edmund William Harrison was born on September 2, 1883, in Souris, Manitoba. On 28 July 28, 1906, in Portage la Prairie, Manitoba, Edmund married Alice Clare Ratchford. Her father was Thomas Ratchford. Her mother was Hannah Dolan. Edmund and Alice lived in Manitoba in 1911 and 1916. In 1917, Edmund enlisted with the Canadian Expeditionary Force to serve during the First World War. He was wounded while delivering despatches on a motorcycle. He returned to Canada in 1919. In 1920, Edmund received a Soldier Settlement land grant in 1920. He abandoned the land by 1928. Edmund and Alice separated. Alice went to live in Winnipeg, where she was living in 1937 and 1940. Edmund changed his last name to Jackson. He died in Saskatoon, Saskatchewan, on December 22, 1963. He was buried in Woodlawn Cemetery in Saskatoon. Alice died in Winnipeg in 1966. Beatrice Harrison was born in Emerson, Manitoba, on October 21, 1885. On March 18, 1920, in West Summerland, British Columbia, she married Thomas William Reed, who was a clergyman. Thomas was born in Wolverhampton, England, on December 12, 1887. His father was George Reed. His mother was Elizabeth Bagnall. In 1921, Beatrice and Thomas were living near Edmonton, Alberta. In 1941, they were in Nanaimo, British Columbia. Thomas died in Vancouver on October 7, 1958. Beatrice died in Surrey, British Columbia, on February 23, 1975. John Weston Philip; Birth: 12 Aug 1808, Scotland; Death: 9 Mar 1897; Burial: Mar 1897, Fairview Cemetery, Roland MB (2-2-N); http://rolandroots.pbworks.com/f/family%20connections/ps03/ps03_086.htm. “Scotland Marriages, 1561-1910,” database, FamilySearch (https://familysearch.org/ark:/61903/1:1:XYWK-99L : 8 December 2014), John Phillip and Helen Knox, 22 Nov 1832; citing Inveresk With Musselburgh,Midlothian,Scotland, reference ; FHL microfilm 1,067,758. “Scotland Marriages, 1561-1910,” database, FamilySearch (https://familysearch.org/ark:/61903/1:1:XYQB-FZV : 8 December 2014), John Philip and Helen Knox, Dec 1832; citing Smailholm,Roxburgh,Scotland, reference ; FHL microfilm 1,067,951, 102,302. Canada Census, 1881, John W. Philips; birth: 1808, Scotland; residence: Dufferin, Marquette, Manitoba, Canada; http://data2.collectionscanada.gc.ca/e/e329/e008210412.pdf. “Manitoba Probate Records, 1871-1930”, database with images, FamilySearch (https://familysearch.org/ark:/61903/1:1:QKBT-9BBX : 1 December 2015), John W Philips, 1898-1899. Helen Knox, Birth: 2 Jun 1807, Scotland; Death: 27 Jul 1885; Burial: Jul 1885, Fairview Cemetery, Roland MB (2-2-N); http://rolandroots.pbworks.com/f/family%20connections/ps03/ps03_087.htm. “Scotland Marriages, 1561-1910,” database, FamilySearch (https://familysearch.org/ark:/61903/1:1:XYWK-99K : 8 December 2014), John Phillip and Helen Knox, 22 Nov 1832; citing Inveresk With Musselburgh,Midlothian,Scotland, reference ; FHL microfilm 1,067,758. “Scotland Marriages, 1561-1910,” database, FamilySearch (https://familysearch.org/ark:/61903/1:1:XYQB-FZJ : 8 December 2014), John Philip and Helen Knox, Dec 1832; citing Smailholm,Roxburgh,Scotland, reference ; FHL microfilm 1,067,951, 102,302. Canada Census, 1881, Ellen Philips; birth: 1808, Scotland; residence: Dufferin, Marquette, Manitoba, Canada, http://data2.collectionscanada.gc.ca/e/e329/e008210412.pdf. Canada Census, 1881, Annie Harrison in household of R. James M. Harrison; High Bluff & Poplar Point, Marquette, Manitoba, Canada; http://data2.collectionscanada.gc.ca/e/e329/e008210373.pdf. “Canada Census, 1891,” database, FamilySearch (https://familysearch.org/ark:/61903/1:1:MW5Y-RDL : 13 November 2014), Annie Harrison, Moose Jaw, Assiniboia West, Territories, Canada; Public Archives, Ottawa, Ontario; Library and Archives Canada film number 30953_148228. “Canada Census, 1901,” database, FamilySearch (https://familysearch.org/ark:/61903/1:1:KHVP-CMV : 13 November 2014), Annie Harrison in household of James M Harrison, I, Brandon, Manitoba, Canada; citing p. 1, Library and Archives of Canada, Ottawa. “Recensement du Canada de 1911,” database, FamilySearch (https://familysearch.org/ark:/61903/1:1:QV9P-VTX2 : 2 March 2015), Annie Harrison in entry for James Harrison, 1911; citing Census, MacLeod Sub-Districts 1-35, Alberta, Canada, Library and Archives of Canada, Ottawa, Ontario; FHL microfilm 2,417,653. “British Columbia Death Registrations, 1872-1986; 1992-1993”, database with images, FamilySearch (https://familysearch.org/ark:/61903/1:1:FLGP-1MF : 30 September 2015), Annie Philip Harrison, 1942. “Find A Grave Index,” database, FamilySearch (https://familysearch.org/ark:/61903/1:1:Q291-2GMZ : 15 March 2016), Annie Philip Harrison, 1942; Burial, Nanaimo, Nanaimo Regional District, British Columbia, Canada, Nanaimo Municipal Cemetery; citing record ID 155841058, Find a Grave, http://www.findagrave.com/cgi-bin/fg.cgi?page=gr&GRid=155841058. Travers of Norfolk and Suffolk; A collection of pedigrees of the family of Travers; by S. Smith Travers, edited by Henry John Sides; Oxford, J.H. and J. Parker, 1864, page 23; https://books.google.ca/books?id=zpgBAAAAQAAJ&pg=PA23&lpg=PA23&dq=london+bombay+%22brailsford%22#v=onepage&q=london%20bombay%20%22brailsford%22&f=false (description of the Brailsford as an East Indiaman). “Ontario Census, 1861,” database, FamilySearch (https://familysearch.org/ark:/61903/1:1:MQW3-FK8 : 8 November 2014), E B Harrison, Howard, Kent, Ontario, Canada; citing p. 48, line 31; Library and Archives Canada film number C-1039-1040, Public Archives, Toronto; FHL microfilm 2,435,859; http://data2.collectionscanada.gc.ca/1861/pdf/4391939_00240.pdf. “Canada Census, 1871,” database with images, FamilySearch (https://familysearch.org/ark:/61903/1:1:M4Q3-NWL : 13 November 2014), Edmund Harinson, Howard, Bothwell, Ontario, Canada; citing p. 47, line 20; Library and Archives Canada film number C-9893, Public Archives, Ottawa, Ontario; FHL microfilm 4,396,328; http://data2.collectionscanada.ca/1871/pdf/4396328_00303.pdf. “Canada Census, 1891,” database, FamilySearch (https://familysearch.org/ark:/61903/1:1:MW2P-HDD : 13 November 2014), Edmund Harrison, Howard, Elgin West, Ontario, Canada; Public Archives, Ottawa, Ontario; Library and Archives Canada film number 30953_148136; http://data2.collectionscanada.gc.ca/1861/pdf/4108074_00193.pdf. “Ontario Deaths, 1869-1937 and Overseas Deaths, 1939-1947,” database with images, FamilySearch (https://familysearch.org/ark:/61903/1:1:J69T-945 : 11 December 2014), Edmund B. Harrison, 19 Jan 1907; citing Howard, Kent, Ontario, yr 1907 cn 15163, Archives of Ontario, Toronto; FHL microfilm 1,854,461. “Find A Grave Index,” database, FamilySearch (https://familysearch.org/ark:/61903/1:1:QVPS-7MJH : 13 December 2015), Edmund B Harrison, ; Burial, Ridgetown, Chatham-Kent Municipality, Ontario, Canada, Greenwood Cemetery; citing record ID 135702314, Find a Grave, http://www.findagrave.com/cgi-bin/fg.cgi?page=gr&GRid=135702314. Canada GenWeb’s Cemetery Project, Edmund B. Harrison; http://geneofun.on.ca/names/photo/578886?PHPSESSID=d0c4c6cfa240592230749c9e66b76203: Edmund B Harrison , 1820-1907; Greenwood Cemetery; 13146 Reeders Line , Ridgetown, Howard Township (Concession 10, Lot 13); Kent County, Ontario. “Find A Grave Index,” database, FamilySearch (https://familysearch.org/ark:/61903/1:1:QVPS-7MJD : 11 July 2016), Mary Sailsbury Harrison, ; Burial, Ridgetown, Chatham-Kent Municipality, Ontario, Canada, Greenwood Cemetery; citing record ID 135702340, Find a Grave, http://www.findagrave.com/cgi-bin/fg.cgi?page=gr&GRid=135702340. Canada GenWeb’s Cemetery Project, Mary (Sailsbury) Harrison; http://geneofun.on.ca/names/photo/578888?PHPSESSID=d0c4c6cfa240592230749c9e66b76203: Mary (Sailsbury) Harrison, 1826-1888; Greenwood Cemetery; 13146 Reeders Line , Ridgetown, Howard Township (Concession 10, Lot 13), Kent County, Ontario. “Writing in the 23 April 1893 edition of the Morden Monitor newspaper, Rev. Borthwick recalled the Rev. J.M. Harrison whose circuit, as noted in the 1877·1878 edition of Henderson’s Directory, consisted of the Boyne and Pembina settlements. “Rev. J. M. Harrison, now ministering in Winnipeg, was the first Methodist minister officiating regularly in the district. The first time the writer and he met was on the open prairie. Mr. Harrison was dressed in hunter’s costume, leather from top to toe, and the writer thought he had come across some wild hunter of the plains after some quarry or other.” . . .
“Ontario Census, 1861,” database, FamilySearch (https://familysearch.org/ark:/61903/1:1:MQW3-FKC : 8 November 2014), James Harrison, Howard, Kent, Ontario, Canada; citing p. 48, line 35; Library and Archives Canada film number C-1039-1040, Public Archives, Toronto; FHL microfilm 2,435,859; http://data2.collectionscanada.gc.ca/1861/pdf/4391939_00240.pdf. Canada Census, 1881, R. James M. Harrison; High Bluff & Poplar Point, Marquette, Manitoba, Canada; http://data2.collectionscanada.gc.ca/e/e329/e008210373.pdf. “Canada Census, 1901,” database, FamilySearch (https://familysearch.org/ark:/61903/1:1:KHVP-CMJ : 13 November 2014), James M Harrison, I, Brandon, Manitoba, Canada; citing p. 1, Library and Archives of Canada, Ottawa; http://automatedgenealogy.com/census/View.jsp?id=62741&highlight=1&desc=1901+Census+of+Canada+page+containing+James+M.+Harrison. “Canada Passenger Lists, 1881-1922,” database with images, FamilySearch (https://familysearch.org/ark:/61903/1:1:2QS1-GZG : 27 December 2014), J M Harrison, Sep 1905; citing Immigration, Vancouver, British Columbia, Canada, T-515, Library and Archives Canada, Ottawa, Ontario. “Said Farewell; Sunday School Children Bidden Adieu by Pastor of Century Methodist Church,” Medicine Hat News, June 13, 1907, page 11; http://www.ourfutureourpast.ca/newspapr/np_page2.asp?code=N8XP0713.JPG. “Welcome to New Pastor,” Medicine Hat News, June 27, 1907, page 3; http://www.ourfutureourpast.ca/newspapr/np_page2.asp?code=N8XP0729.JPG. “Recensement du Canada de 1911,” database, FamilySearch (https://familysearch.org/ark:/61903/1:1:QV9P-VTXK : 2 March 2015), James Harrison, 1911; citing Census, MacLeod Sub-Districts 1-35, Alberta, Canada, Library and Archives of Canada, Ottawa, Ontario; FHL microfilm 2,417,653; http://automatedgenealogy.com/census11/View.jsp?id=11668&highlight=33&desc=1911+Census+of+Canada+page+containing+James+Harrison. “British Columbia Death Registrations, 1872-1986; 1992-1993”, database with images, FamilySearch (https://familysearch.org/ark:/61903/1:1:FL29-V9T : 30 September 2015), James Morrell Harrison, 1915. “Find A Grave Index,” database, FamilySearch (https://familysearch.org/ark:/61903/1:1:Q291-2B1K : 15 March 2016), James Morrell Harrison, 1915; Burial, Summerland, Okanagan-Similkameen Regional District, British Columbia, Canada, Peach Orchard Cemetery; citing record ID 156422123, Find a Grave, http://www.findagrave.com/cgi-bin/fg.cgi?page=gr&GRid=156422123. “Reverend J.M Harrison Passed Away Sunday,” Claresholm Advertiser, August 21, 1915, Page 1, Item Ar00109; http://peel.library.ualberta.ca/newspapers/CHA/1915/08/21/1/Ar00109.html?query=newspapers%7C%22j+m+harrison%22%7C%7Cscore. “Canada Census, 1891,” database, FamilySearch (https://familysearch.org/ark:/61903/1:1:MW5Y-RDG : 13 November 2014), Mary Edith Harrison, Moose Jaw, Assiniboia West, Territories, Canada; Public Archives, Ottawa, Ontario; Library and Archives Canada film number 30953_148228. “Canada Census, 1901,” database, FamilySearch (https://familysearch.org/ark:/61903/1:1:KHVP-CMK : 13 November 2014), Mary Edith Harrison in household of James M Harrison, I, Brandon, Manitoba, Canada; citing p. 1, Library and Archives of Canada, Ottawa. “Canada Census, 1901,” database, FamilySearch (https://familysearch.org/ark:/61903/1:1:KHGF-4JS : 13 November 2014), Wm E. Sibley in household of Thas Wray, A, Toronto (centre) (city/cité), Ontario, Canada; citing p. 7, Library and Archives of Canada, Ottawa; http://automatedgenealogy.com/census/View.jsp?id=104857&highlight=33&desc=1901+Census+of+Canada+page+containing+Wm+E.+Sibley. “Canada Passenger Lists, 1881-1922,” database with images, FamilySearch (https://familysearch.org/ark:/61903/1:1:2Q9V-7Q4 : 27 December 2014), Wm Edw Sibley, Apr 1912; citing Immigration, Eastern US Ports, United States, T-4691, Library and Archives Canada, Ottawa, Ontario. “Vermont, St. Albans Canadian Border Crossings, 1895-1954,” database with images, FamilySearch (https://familysearch.org/ark:/61903/1:1:QKQ9-QDTJ : 9 October 2015), Wm Edward Sibley, 1895-1924; citing M1461, Soundex Index to Canadian Border Entries through the St. Albans, Vermont, District, 1895-1924, 332, NARA microfilm publications M1461, M1463, M1464, and M1465 (Washington D.C.: National Archives and Records Administration, publication year); FHL microfilm 1,473,132. “Hawaii, Honolulu Passenger Lists, 1900-1953,” database with images, FamilySearch (https://familysearch.org/ark:/61903/1:1:QV9Z-2BKN : 30 December 2014), William Sibley, 1936; citing Ship , NARA microfilm publication A3422 (Washington D.C.: National Archives and Records Administration, n.d.). 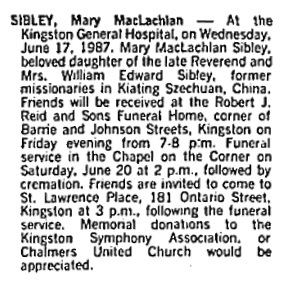 William Edward Sibley, death notice, Toronto Globe and Mail, July 18, 1959, page 37. Emerson Coatsworth; Wikipedia article, https://en.wikipedia.org/wiki/Emerson_Coatsworth. “Wife of Judge Stricken at 83: Mrs. Coatsworth Dies After Fall in Home,” Toronto Globe and Mail, February 23, 1943, page 7. “Jurist Dean of Toronto Passes Away: Judge E. Coatsworth Active Through Life in Civic Affairs,” Toronto Globe and Mail, May 12, 1943, page 4. Helen Robertson Coatsworth, death notice, Toronto Globe and Mail, July 10, 1995, page D7. “Canada Census, 1891,” database, FamilySearch (https://familysearch.org/ark:/61903/1:1:MW5Y-RDP : 13 November 2014), Ella Irnax Harrison, Moose Jaw, Assiniboia West, Territories, Canada; Public Archives, Ottawa, Ontario; Library and Archives Canada film number 30953_148228; http://central.bac-lac.gc.ca/.item/?app=Census1891&op=pdf&id=30953_148228-00342. “Canada Census, 1901,” database, FamilySearch (https://familysearch.org/ark:/61903/1:1:KHVP-CM2 : 13 November 2014), Ellie Knox Harrison in household of James M Harrison, I, Brandon, Manitoba, Canada; citing p. 1, Library and Archives of Canada, Ottawa. “Canada Census, 1891,” database, FamilySearch (https://familysearch.org/ark:/61903/1:1:MW5Y-RD5 : 13 November 2014), Edmund William Harrison, Moose Jaw, Assiniboia West, Territories, Canada; Public Archives, Ottawa, Ontario; Library and Archives Canada film number 30953_148228. “Canada Census, 1901,” database, FamilySearch (https://familysearch.org/ark:/61903/1:1:KHVP-CML : 13 November 2014), Edumund Wm Harrison in household of James M Harrison, I, Brandon, Manitoba, Canada; citing p. 1, Library and Archives of Canada, Ottawa. “Canada Census, 1901,” database, FamilySearch (https://familysearch.org/ark:/61903/1:1:KHVP-CMG : 13 November 2014), Beatrice Katherine Harrison in household of James M Harrison, I, Brandon, Manitoba, Canada; citing p. 1, Library and Archives of Canada, Ottawa. “Recensement du Canada de 1911,” database, FamilySearch (https://familysearch.org/ark:/61903/1:1:QV9P-VTXL : 2 March 2015), Beatrice Harrison in entry for James Harrison, 1911; citing Census, MacLeod Sub-Districts 1-35, Alberta, Canada, Library and Archives of Canada, Ottawa, Ontario; FHL microfilm 2,417,653. “British Columbia Marriage Registrations, 1859-1932; 1937-1938,” database with images, FamilySearch (https://familysearch.org/ark:/61903/1:1:JDD7-2X2 : 21 January 2016), Thomas William Reed and Beatrice Kathleen Harrison, 18 Mar 1920; citing West Summerland, British Columbia, Canada, British Columbia Archives film number B12904, Vital Statistics Agency, Victoria; FHL microfilm 2,032,873. “British Columbia Death Registrations, 1872-1986; 1992-1993”, database with images, FamilySearch (https://familysearch.org/ark:/61903/1:1:FLB5-X79 : 30 September 2015), Beatrice Kathleen Reed, 1975. “British Columbia Death Registrations, 1872-1986; 1992-1993”, database with images, FamilySearch (https://familysearch.org/ark:/61903/1:1:FLRM-LX2 : 30 September 2015), Thomas William Reed, 1958.